Our Chunky Knit Gloves offer a comfy fit when cold winds blow. The traditional cable pattern features flecks of metallic yarn for shimmering style. 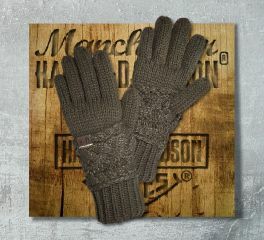 These women's knit gloves are great to coordinate with the matching Chunky Pom Knit Hat. Design Details: Knit-in cable pattern with flecks of metallic yarn. 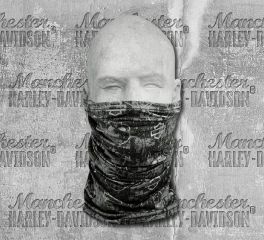 Protect your face and neck during cold weather ride with Harley-Davidson® White Graphic Neck Gaiter. It has printed graphics that adds up to the coolness of the wearer. It features a Coolcore™ Technology which offer a comfort through thermal regulation. Coolcore™ fabric expertly manages heat and moisture through three distinct functions: moisture wicking (to absorb sweat away from skin), moisture circulation (the fabric allows air to circulate), and regulated evaporation (as air circulates, moisture is released). It all works together to help keep you cool and comfortable. Protect your face and neck during cold weather ride with Black Neck Gaiter with CoolCore™ Technology. It has printed Harley-Davidson® lettering below. Protect your face and neck during cold weather ride with Allover Printed Neck Gaiter with CoolCore™ Technology. It has printed graphics allover. Protect your face and neck during cold weather ride with Black Balaclava with CoolCore™ Technology. It has Classic Bar&Shield® logo located on front of the neck..